It’s amazing how quickly a well timed suggestion can grow. For me it was an email from Chris Martin, race director of the Aorangi Undulator, a brilliant new mountain race in the rugged hills of Aorangi Forest Park that I‘d recently had a pretty good crack at. The email simply read “This is your next challenge mate” and contained a conversation between Chris Swallow and Grant Guise, both recent members of the fabled S-K sub 24 hour club. Sometimes a suggestion is all that’s needed. As a 20 year old I remember being amazed while reading Graham Dingles’ autobiography of his epic feats of running close to full days in the Tararuas without stops or sleep. One of the feats that especially stuck with me was his 1965 Putara-Smith Creek traverse which he completed in 18hrs 30min. 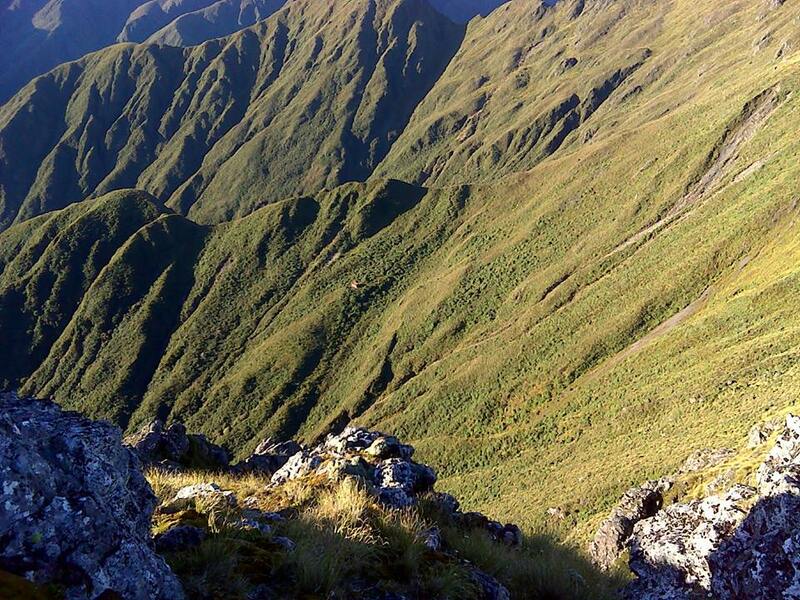 I just couldn’t get my head around anyone running for that long , let alone in the wild backcountry of the Tararuas. Most importantly it gave me the confidence to get researching and planning for an S-K attempt. From the outset my approach was to be Solo/Unsupported. There had been some great historical S-K’s tackled in this way, most notably Gary Goldsworthy’s 25 ½ hr epic in 1988. For me I wanted to test myself mentally as well as physically and I was intrigued to see how things would play out throughout the day with the responsibility of going on resting squarely on my own shoulders. Almost a month after my Taranaki run, with conditions looking favorable for an attempt a little earlier than I had planned, I decided that given the Tararuas famous ability to turn sketchy it was time to go for it. The plan was to head out of Wellington on Friday evening with my Dad and overnight it in Putara, ready to be at road end at sparrows fart on Saturday morning. Arriving in Putara, it was early doors on bedtime at 10pm, sharing an airbed with my old man and a bunch of local moths all vying for the best spots on my face. A middle of the night pee had me standing under a mind boggling ceiling of stars undiluted by the normal city glare of Wellington, and I decided no matter what the day ahead had in store, I had it pretty good. My 3am alarm dragged me from my dreams of checkpoints and drink stops and it was time to get dressed, jump on the scales and boil the billy. A quick breakfast of oats washed down with a coffee was followed by liberal applications of sunscreen (a task I was destined to reenact many times throughout the sweltering day to come). After a final gear check it was into the car for the drive out to Putara road end and the start of my S-K.
With head torch on I gave my Dad a hug farewell and watching the clock tick over 4am I started my watch and hit the trail. It felt good to be running , almost a little bit surreal knowing little of what the day ahead had in store for me. I had to remind myself that there was a monster made of hills ahead of me and to take it easy. 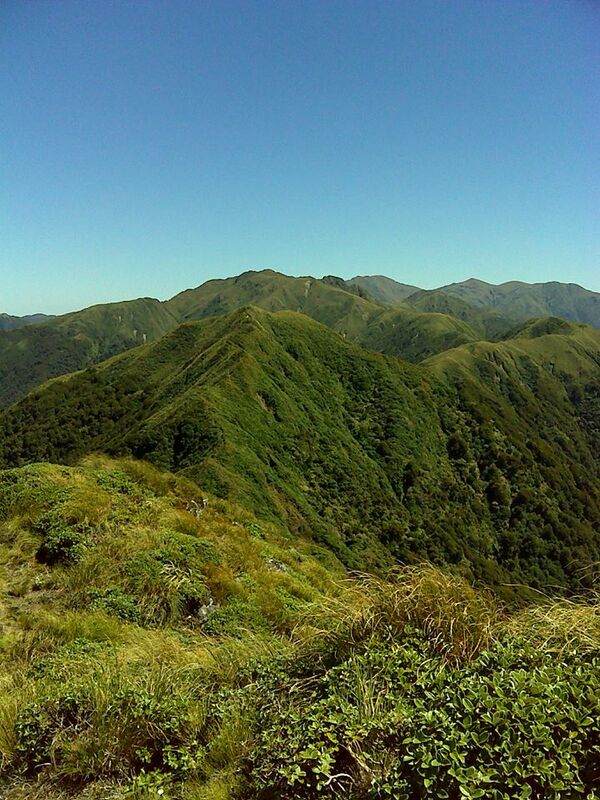 The section to Herepai Hut is typical Tararua bush track, muddy and root strewn as it initially follows the Mangatainoka River. 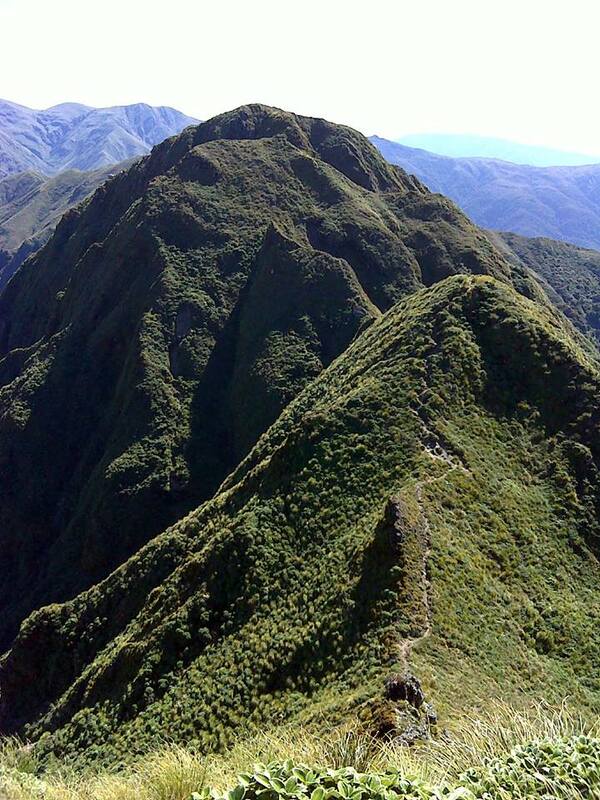 It then climbs to a ridge which eventually leads to the Hut. Halfway there I stopped to strip back to my T-shirt and knew then that the heat was going to be one of the biggest factors of the day. Arrival at Herepai Hut meant time to fill all my bottles in preparation for the 5 hours or so until my next water stop at Drac Hut in the heart of the Tararuas. As I filled up outside it was easy to imagine a Hut full of trampers happily snoring away, but I was glad to be up and running towards dawn. 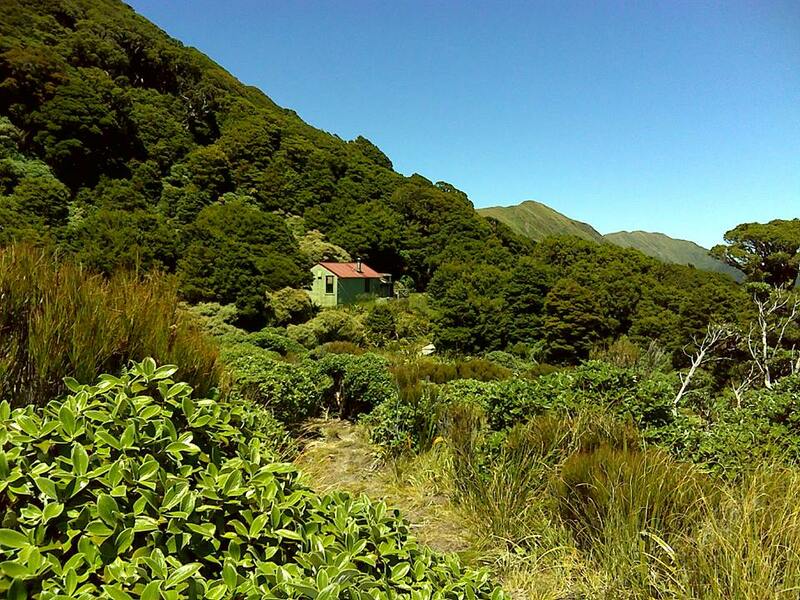 Soon after leaving Herepai Hut I was climbing again with the bush quickly thinning out and turning to scrub. It’s about here that the trail turns from easily distinguishable to barely there as any worn path is drowned by the grasses and gnarly Leatherwood waiting to gouge out skinny shins. 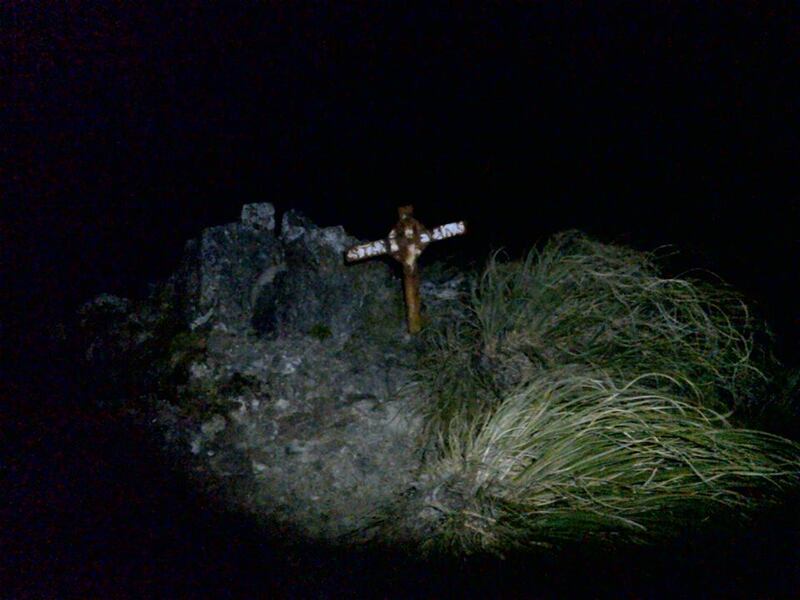 The Stan Evans memorial came looming out of the darkness into my torchlight signaling my arrival at Herepai. As I began the ridgeline scramble to Ruapei a cloudless, windless dawn began to open up over the Wairarapa Plains to the east of me and I felt pretty bloody lucky to be able to be where I was. Following Ruapei came the narrowest section of ridge I’ve ever traversed, seemingly held together by the very Leatherwoods along it’s scrawny spine I swore I could feel it wobbling beneath my feet. A throbbing sound in the distance grew gradually louder and looking north of Ruapei I soon saw a helicopter hugging the ridge, which eventually buzzed by, passing me up in search of Bambi. A scree littered slope up the flanks of East Peak and a full load of water made for a slow climb and I was glad to see the Waratah announcing the top. Dropping down into the Saddle between East and West Peaks I was once again into thick Leatherwood and I kept repeating the mantra I’d learnt form Chris Swallow on a recce of this section two weeks prior: “Keep right, keep right, keep right…”. Seems to work except for when it’s best to keep left… As I began to climb again I glanced up at West Peak and was confronted by four sets of eyes staring back at me. A group of deer were traversing the peak and had stopped to wonder at this mad creature obviously well outside of its normal habitat, climbing towards them. They wisely moved on to the north away from the helicopter. Shortly after I heard shots from the East and figured the helicopter had found a cousin of my new friends, hardly sporting if you ask me. From the top of West Peak the ridgeline caught the first of the morning sun turning all the tussock golden as it sawtoothed it’s way southwest towards Mt Dundas and Arete. 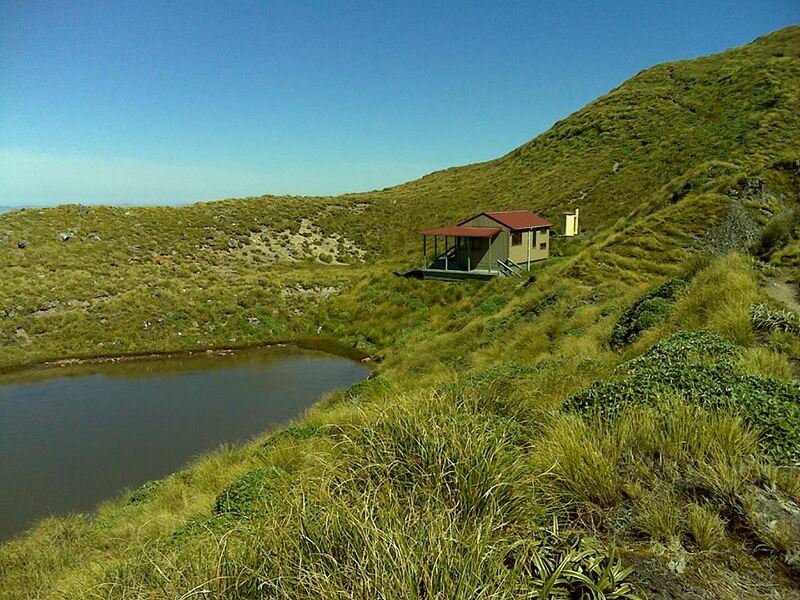 This section is amazing as you are surrounded by big craggy hills with views over the Ruamahunga headwaters to the broad flat top of Cattle Ridge. There was barely a visible foot trail so it was just a matter of hunting the path of least resistance and going for it. On cresting Pukemoremore, Dundas Hut came in to view clinging to the steep hillside below point 1415 in the morning sun. Both times I have seen it the Hut has looked like a brilliant place to wake up, and I marked it for future adventures. Sure enough the throb of a helicopter caught my attention again and peering across at Cattle Ridge the machine retreated to the north with a beast hanging between its skids. Carrying on along the ridgeline soon Logan had fallen behind and I was racing my shadow up the steep flanks of the dome topped Mt Dundas. From the top of Dundas all the way to Bridge Peak 10 hours or so in my future was all new territory for me and this is where the adventure really began. Despite unlimited visibility I thought it prudent to take a 185 compass bearing off the summit which soon had me running down a southerly ridgeline. The approach to Arete took me past a bunch of craggy peaks to the southwest and it was hard to know whether to watch my feet or the view. Passing Arete Hut tantalisingly close yet so far away I was waved on by another helicopter which had just lifted off from the Hut, and I was soon at the cairn marking Arete summit. Here the view opened up over Pukematawai stretching out all the way to the plains of Levin, with the Tasman in the background. Arrival at the Pukematawai junction also meant the start of DOC cut trail, as this section is part of the Te Araroa Trail. By this point my knees were starting to feel the extra weight of a pack carrying a days food and the extra water required for this dry northern section of the route. 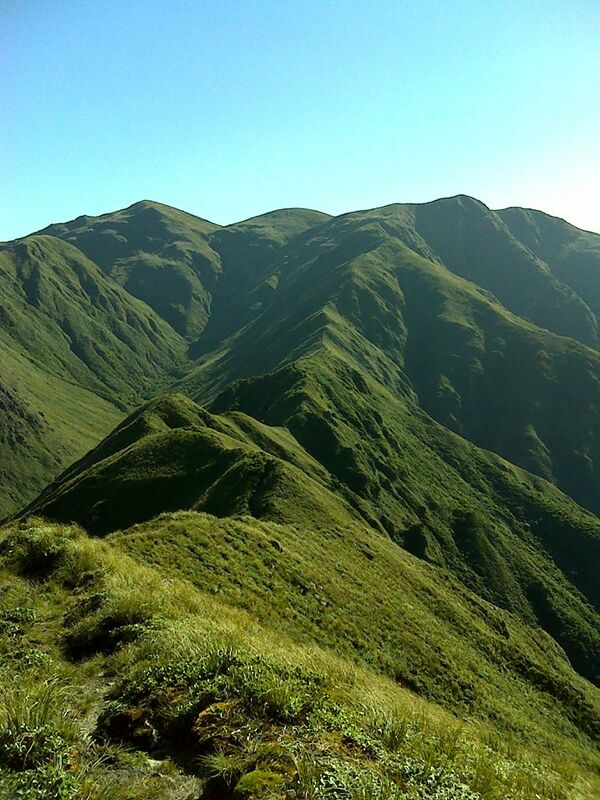 So while it was a little sad to get away from the feeling of remoteness that the barely trodden ridge affords, it felt like bliss to be running on ground where you could actually see where you were putting your feet. By now the sun had well and truly started cranking it up and I was glad for the extra bottles I was carrying, as there was still not a breath of wind to cool my sweat. From here the ridge drops steeply towards Butcher Knob where, looking back to the northeast, views of the majestic post-glacial Park Valley open up. Soon after coming off Butcher I plunged into the first bush since dark, and it was a great relief to get out of the already oppressive heat. After a short climb, with all my bottles drained, the tiny bright orange Dracophyllum was a sight for sore eyes. Looking dubiously at the tiny water tank beside the hut I was thankful when water came gurgling out on turning the tap. Dousing myself thoroughly was a welcome relief from the heat and with bottles topped up I plunged back into the bush heading for Nichols. Shortly after passing Puketoro I made my only navigational blunder of the trip. Not concentrating properly I found myself once again in the hot sun above the bush line, following what I believed to be the foot trail. After a bit of clambering and wondering if I was following the right route I found myself on a high point dropping off sharply to bush all around. To my dismay I had drifted west and the main ridge dropped steeply away from a parallel section a few hundred meters to the east. Rather than backtrack I decided to see if I could bridge across by heading directly east, but soon found myself perched above a steep bluff with dense scrub at its base and no clear way down. Cursing my lapse in concentration I was forced to backtrack until I rejoined the seemingly obvious trail south. Here the ridge dropped steeply into the bush but it wasn’t long until I was climbing again and I soon found myself on top of Nichols looking down on the hut. The route from Nichols summit takes a dog leg turn to the west, which in murky conditions could be tricky, but on this cloudless day was straight forward. From here to Andersons it was back onto the tops in the relentless baking heat, and I kept on finding my thoughts turning to dreams of gentle Zephyrs that would never eventuate. Climbing steeply again I saw what I thought were possibly the first people of the trip perched on Mt Crawford but, as I climbed higher and got closer, this revealed itself to be a blank white board catching the sun’s light and reflecting it back to my fatigued mind. On reaching Junction Knob I hurried past the bailout option of Waitewaewae. I was feeling strong and despite the heat was still in good spirits. Soon I was dropping down to the relatively flat plateau leading to Anderson Memorial Hut and I relished this reprieve from the constant ups and downs of the day so far. With dry bottles again, the hut nestled cosily against the bush was a welcome sight. Another dousing of cool tank water and with bottles replenished it was time to bust on again. From Andersons it was straight back into the bush and I was soon running through a trippy looking mossy goblin forest. On breaking out above the tree line I found myself clambering towards Kahiwiroa and it was here, almost 10 hours after setting out, that I ran into my first real human being. The young fella was traveling light and on prompting revealed that he was doing a Southern Main Ridge – Waitewaewae – Forks day loop. Hearing that I was heading to Kaitoke he asked where I’d started. He hadn’t heard of Putara so I pointed vaguely northeast and said “over that way” – that about summed it up. As much as it was good to be back in contact with other people it was time to keep on pushing, so I wished him well and resumed my climb. 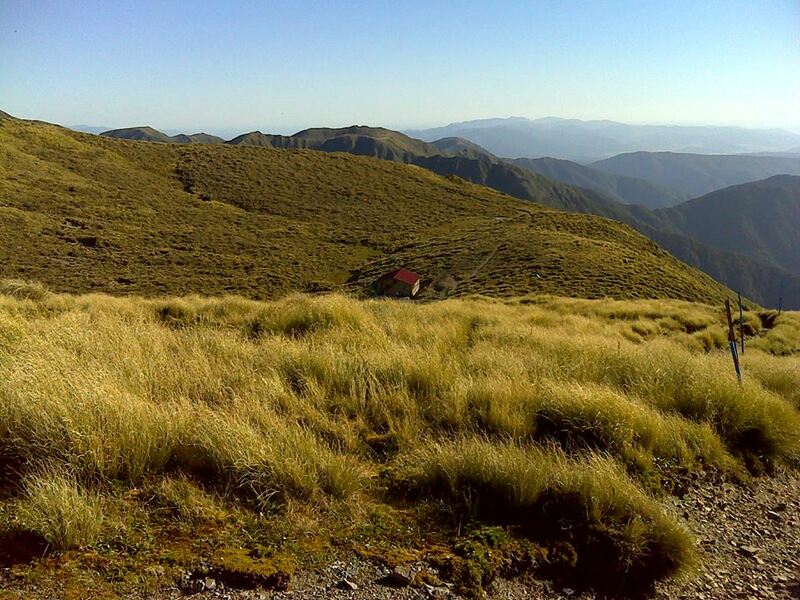 I passed another tramping party taking a breather on the broad top of Aokaparangi who looked at me like I was a bit strange in my running gear, and it was here that I caught my first view of Maungahuka Hut sitting high on a plateau beyond the saw toothing Wright and Simpson. 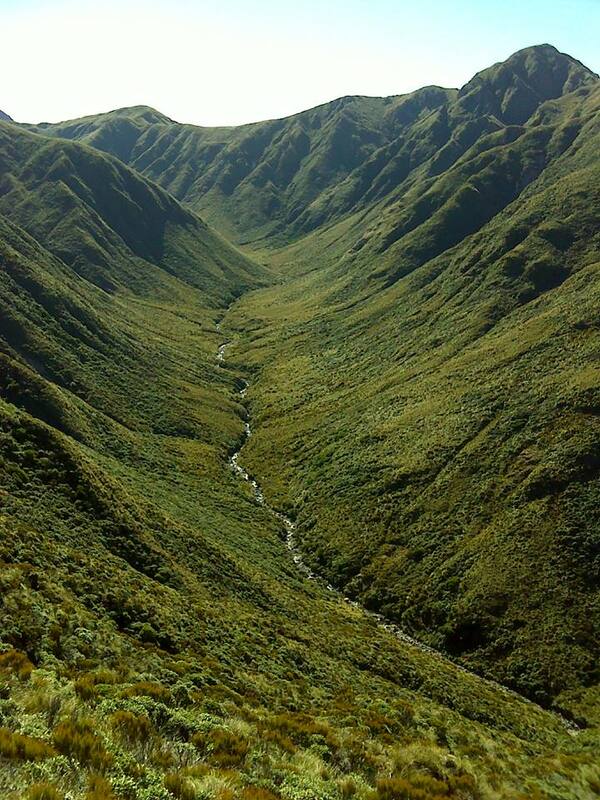 I’d been looking forward to this next section taking in the Southern Main Ridge, and this buoyed my spirits. 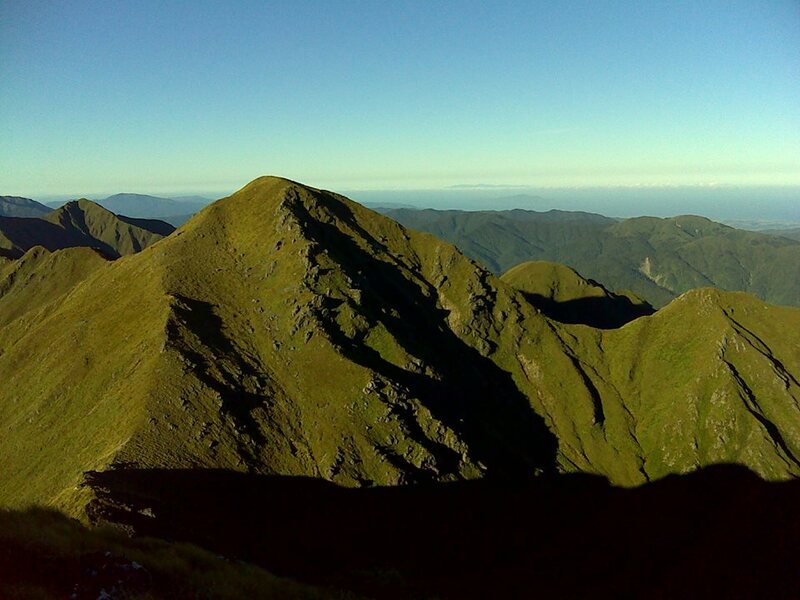 Following DOC’s blue poles again I climbed up the mound behind the hut and was soon looking down the steep descent switch backing its was down to the base of the Tararua Peaks. 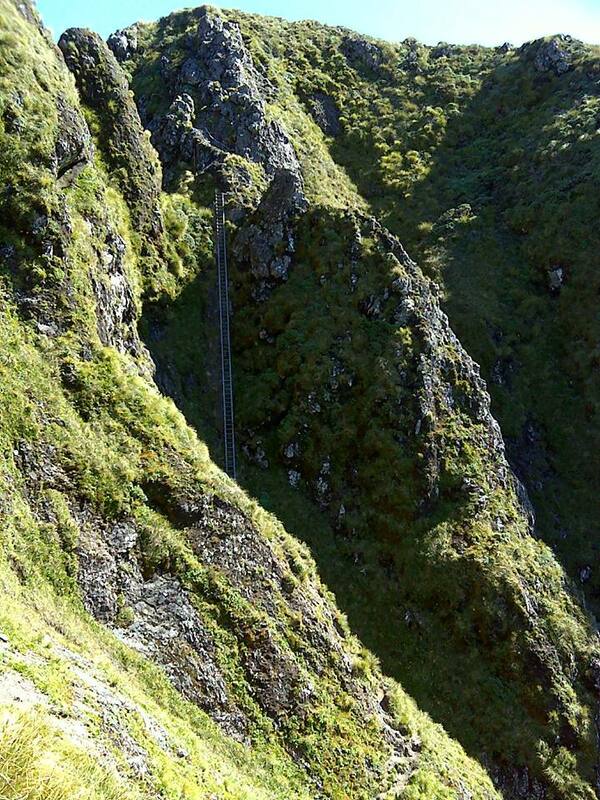 Sidling around Tunui, the massive steel ladder heading up the precipitous side of Tuiti came in to view. What a cool place this is – I can only wonder at the history of the place. Halfway up the ladder, and a quick glance at the drop below me, made me thankful that I wasn’t on the old chain ladder that I’d seen in photos during my research. I imagine that coming through here in ugly weather would be quite an experience. Upon dropping down from Yeates and back into the climb up Vosseler, the leg cramps, which had until now only been a whispered suggestion, began to effect my climbing. With so much of the journey still ahead of me I knew that I had to get on top of this quickly. Soon I had developed a breathing mantra, concentrating on expelling all of the spent air from my lungs every second exhale, thus allowing more room for good oxygen replenishing air on the inhale. It was focusing on this, with the sound of rushing water deep in the valley to my left, that had me in a trancelike state as I made the long climb up to Bridge Peak. It was easy to imagine turning right at the top of the climb for the short drop down past Field Hut and to the welcoming grassy plains of Otaki Forks for a cooling dip in the river, but I hadn’t come all this way to bail out now. Instead, turning left, I seemed to be cresting the top of Hut Mound in no time and Kime Hut lay waiting with its beckoning water tanks in the basin beyond. With no reprieve from the heat despite the approach of evening, I guzzled water at the hut before dousing myself again, and tanking up. The clamber from Field Peak to Mt Hector was an ugly one, as I appeared to be paying for the fast climb up Bridge, and it was a relief when the memorial cross at the summit came majestically into view. 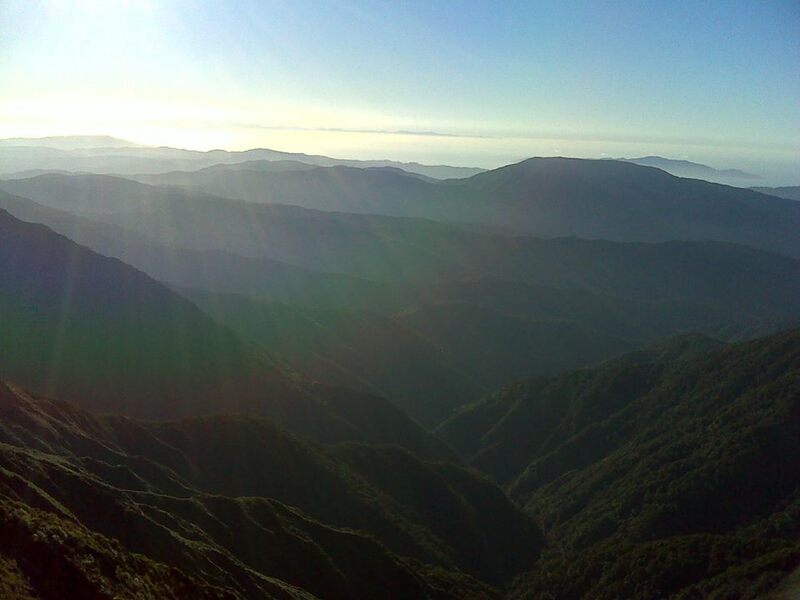 It was around 7:30 in the evening and still baking hot, but making up for this was the view to the southwest with the low sun silhouetting the layers of hills stretching all that way back to the top of the Marlborough Sounds across Cook Strait. Reaching the highest point of the route was mentally a big milestone and I attacked the next section with renewed energy. Soon the Beehives and Atkinson had fallen behind me and the junction at Aston signaled some nice open running on the approach to Alpha. Descending towards the bush line from Alpha in the fading twilight, my knees were really starting to suffer and the soles of my feet felt like they were trying to detach themselves. 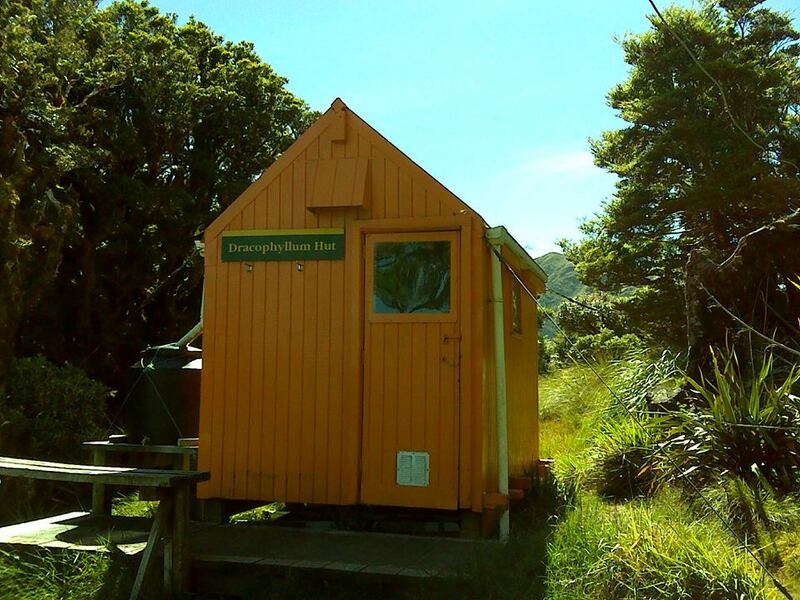 It was a relief to get to the bottom of the rutted track as Alpha Hut loomed up, nestled cosily in the bush. Standing at the water tank filling all my bottles for the long trip down Marchant, I could hear the murmured conversation of comfy trampers from the other side of the wall and could only imagine what it would be like to stop and put my feet up. Donning my head torch in preparation for the advancing darkness, it was time to get moving again before everything had the chance to seize up. Twilight’s a funny time to be running in the bush, with not enough sunlight to see the trail in detail and head torch being fairly ineffective. I just blundered on hoping my feet would respond to the rough terrain and unseen tree roots. Soon it was full dark and the head torch began to do its job properly as I made the dip through Hell’s Gate. With only a crescent moon, in the bush the darkness was complete, with vision condensed to a narrow tunnel of dim light. The Bull mound junction appeared and although I knew this section of track my fatigued mind forced me to stop and read the signs to make sure I continued in the right direction. On the Marchant Ridge proper I went into autopilot and it was about here that I started losing track of feed and drink times, probably guzzling more than I needed to in the muggy conditions. The wooden sign at Block XVI materialised out of the gloom, signaling my last checkpoint and the first third of Marchant behind me. With brain close to taking a vacation, and a days running in my legs, Marchant seemed like it would go on forever. Negotiating tree fall and the unpredictable direction changes of the trail had me, on more than one occasion, crashing around in the bush trying to re-find the track. On one of these occasions, having picked up the trail again, I suddenly started to feel like I’d seen this all before. On pulling out the compass I found that I was indeed running back the way I’d just come, the downhill slope fooling me into thinking I was headed south! Perception becoming a little warped at this stage I managed to drink my bottles dry and with nothing to dilute my gels down with, the legs began to slow. Still keeping up a march like plod I put a call through to my old man waiting in Kaitoke to say I was still okay but I wasn’t going to be getting there in a hurry, I was going to be doing this last section hard. Marchant was finally done with me as I hit the clay trail and pushed through the overgrown gorse without feeling it, down towards the Smith Creek junction. At one point my addled brain briefly had me convinced that I’d missed it and was plunging down towards the Tauherenikau Valley. After a few minutes of mad backtracking, logic kicked in as a recognised where I was, and I turned around again and carried on down to the junction and the site of the Old Dobson Hut. From here I knew my journey was almost over and despite having legs that were in early stages of shutdown my spirits soared knowing that I’d broken this monster, and I pushed on over the easier terrain towards my final destination. 20minutes or so from Kaitoke I saw a light bobbing towards me and soon my Dad appeared in my torch light. He’d walked in to play “Tail End Charlie” should I collapse, but this close to my goal nothing was going to stop me. Aware that I was anxious that this be Solo/Unsupported Dad fell back to let me pace myself to the finish and not undo the work of the previous 22+ hours on a technicality. The last junction soon appeared and, on legs that didn’t know what was going on, I ran the flat grassy section before hitting the steep stepped descent down to the carpark at Kaitoke. My legs sent my brain a heap of negative feedback down this last section but in reply my brain sent back a heart felt “Shut up legs!!!”. Past the ropes and obstacles of the camp there was one more mean little climb, a mere bump on any other day. All of a sudden the point I’d been plugging away all day towards was there in front of me. It was a surreal feeling passing through the gate and stopping the clock as I reached the dark carpark, 22 hours and 34 minutes after setting out on a journey of discovery early the previous morning. I’d completed the Epic in a new record for both Solo and Solo/unsupported, and while I was too broken to really take it all in, I’m sure there was a massive smile on my face as I hugged my old man like I hadn’t seen him in weeks. While this adventure was of a Solo/Unsupported nature, these things are seldom without a great support network of people who help make it happen. For planting the seed and his encouragement from the outset I’d like to thank Chris Martin aka Martini, you’re an asset to the running community mate. Chris Swallow shared a great deal of his intimate knowledge of the route and provided great company on a recce of the rugged northern section. 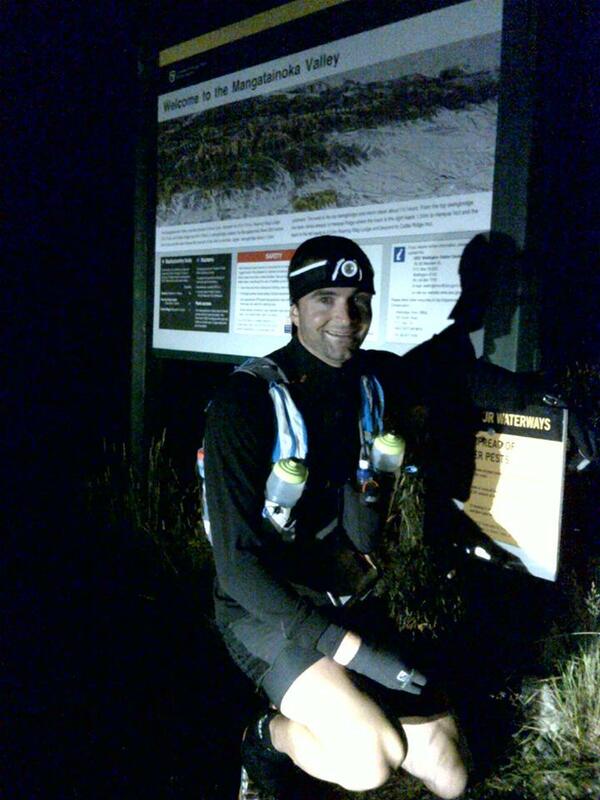 Current record holder Matt Bixley was more than happy to share his splits and navigational notes. There was even an offer by Paul Helm to run all the way in to Andersons to provide a cuppa on my way through, which I sadly turned down, but man what an offer. I was blown away by the enthusiasm and support of the Wellington mountain running community and it’s exciting to see a renewed interest in this epic route. I look forward to helping future attempts and while my approach was the solitary one I believe there’s just as much merit to a fully supported “light and fast” approach – I look forward to seeing those records fall. Over the long day Dad was there for me as I set out on my adventure and there to welcome me home, and I know there will be many more adventures for us to share – thanks Dad. And finally to Mum, Em and Ruby back home, your patience with us boys and our crazy ideas is great and the support always there, thanks for helping us do what we do. Epic stuff Tim. I was informed of your effort by Paul at the post Jumbo-Holdsworth BBQ and was able to check in to facebook to see your progress. We were all gunning for ya while admiring the view of the Tararuas from Masterton. It’s a mission I plan to do one day, so you may be hearing from me in the future to pick your brain. Once again, fantastic effort. Cheers Andrew! Recon the updates keep it interesting for other people aye. I’d be glad to help in any way and there’s a great network of people on this site who I’m sure feel the same. Feel free to drop me an email or FB message. Tim. Congratulations on breaking the record and well done on a magnificent run. Great job on a well written article and all the best with the next “challenge”.